My sister and I were walking through the mall and everyone was wearing a Marvel T-Shirt. I lamented this fact. Though I like it that more people are into superheroes, it’s a bit of a drag to see people wearing it as if it were now nothing, whereas previously wearing shirts with superheroes was a badge of membership to a small group of enthusiasts (okay, geeks) and also a possible reason for people to think of you as being weird. I know that last line sounds like a hipster lamenting the mainstream-ness of a thing that they once loved. Two crucial differences though. First is that, well, I’m not a hipster. Second is that I won’t ever stop loving comic books and superheroes even if they do achieve mainstream popularity as they’ve done. If that were the case, then I would have quit on them a long time ago, sometime in between Spiderman 2 and The Dark Knight. What this is though, is a reaction to the kind of commitment that geekdom once demanded, and how that is now generally eroded. This was tackled quite eloquently by Patton Oswalt and his exposition of ETEWAF, and I agree with a lot of his arguments. One of his big points was that to be geeky before, you had to make a real effort, and such efforts became part and parcel of the outsider status of the geek. Now, geeky content is just as easy to access as is mainstream content. And so the T-shirts. 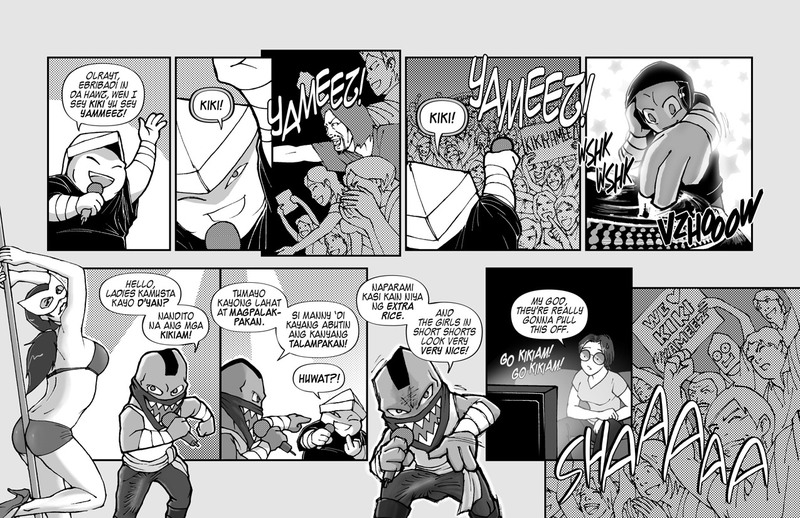 Keeping in mind that most of the people wearing the shirts don’t really know the characters, they can’t identify the cover which they are even wearing, and they, well, they don’t really know the comics. This would be the equivalent of wearing Kobe Bryant’s or Lebron James’s basketball jerseys and not knowing who they were, but really digging the jersey’s colors and how there were in fashion. I hold my own personal angst as, when I was lucky to make a recent trip to the states, I spent quite a bit of time getting some good comic book t-shirts, because they had been so previously hard to come by. If I had wanted comic book shirts, I would have been paying a hefty price (the going rate was something like P1000 per shirt at a lot of the comic book stores for official merch) or I had to hope to get lucky during trips to the tiangge. And just when I’m rocking the nerdy comic book shirts, suddenly they become the in-thing. I can’t help but sound snobbish or hipsterish or pretentious. And I hate it that that’s what inevitably comes across. But it’s this much larger question: There are the cool kids, and they have their thing right? And the uncool kids, they have their own thing. It’s usually the uncool kids trying to join the cool kids and the cool kids rejecting them and maintaining the status quo. All identities are intact. But the new development is that the cool, the mainstream, and most everyone else, is now appropriating that which was believed to be uncool. So where does that leave the uncool, when one of the things that made them uncool, one of the things that they could cling to as refuge in their uncoolness, is suddenly taken from them and made everyone’s. You don’t have the uncool kids suddenly becoming popular. You just have the uncool kids losing a part of their identity, the uncool kids being stripped of something they held dear so that everyone could claim a bit of it. Granted that might sound overly dramatic, but the sudden change in identity (no longer as maven, outsider, and specialist, but mere member of the mass who likes a specific something, and what’s worse even though the geek has a specialization and knows his stuff which would mean geek cred within the geek community, the larger group of people could care less about your knowledge of apocrypha, your intimate study of the mythos of superheroes, and your extensive research in the developments of major tropes through a series of continuity-defining events) leads, rather than acceptance by the mainstream, to further alienation and removal from the mainstream. As little as I would like to admit it, I have to say that even though I am a geek with glaring social inadequacies and insecurities, I would still like to be accepted, to be heard and appreciated. And I feel that rather than the mainstream acceptance signaling a chance for more understanding of geeks, it’s merely another thing that has been co-opted by the endless struggle of popular culture as it is appropriated and re-appropriated and the lines of thought and authenticity blur as new meanings and readings are created. Geeks will still be geeks, jocks will still be jocks, the popular kids, will, as ever be the popular kids, and the weirdos will always stand to a side talking about continuity and retcons, movies and music and video games. They will talk with a kind of reckless abandon, and unabashed love, and an irrepressible enthusiasm that can never be bought, co-opted, or placed in a neatly marketable project. And it’s that combination that leads to geeks not being and never being cool, and also to illustrate what it truly is like to be a geek. Every year brings about new developments in moviemaking technology, and so it’s almost a given that we will be astounded with some kind of visual effects extravaganza. Last year gave us Avatar, which was really Pocahontas with blue aliens. 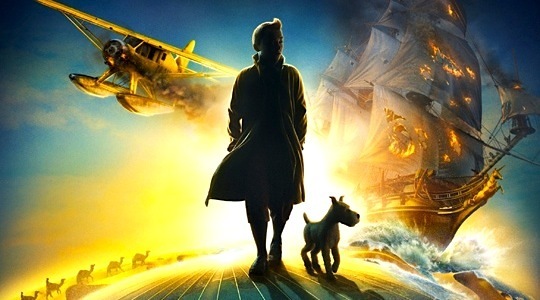 It was brilliant in action and its use of 3-D, but rather lackluster when it came to story. In the last year or so I’ve had the luck to meet and hang out with Mike David, creator of the wildly popular, extremely raunchy and over the top Kubori Kikiam. David is a very cool dude and I suppose my experience with his comics is common for many people: I can’t help but laughing out loud. Sometimes I even remember panels, punchlines, or sight gags when I’m out on the street and my mind is wandering and I giggle to myself. 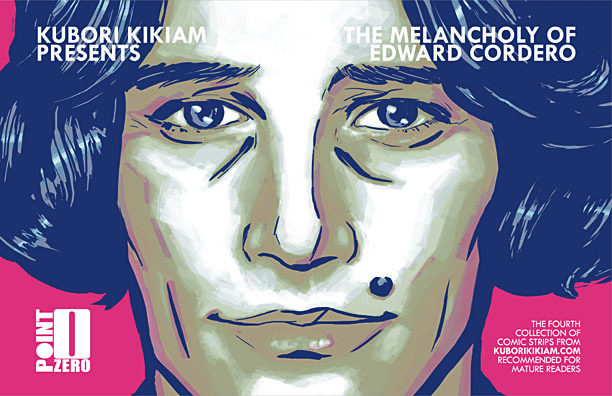 So it came as a very pleasant and flattering surprise that a couple of weeks or so ago, I got a text from David asking me to writer a blurb for the new Kubori Kikiam book, The Melancholy of Edward Cordero. Not surprisingly, it was funny as hell, as usual.